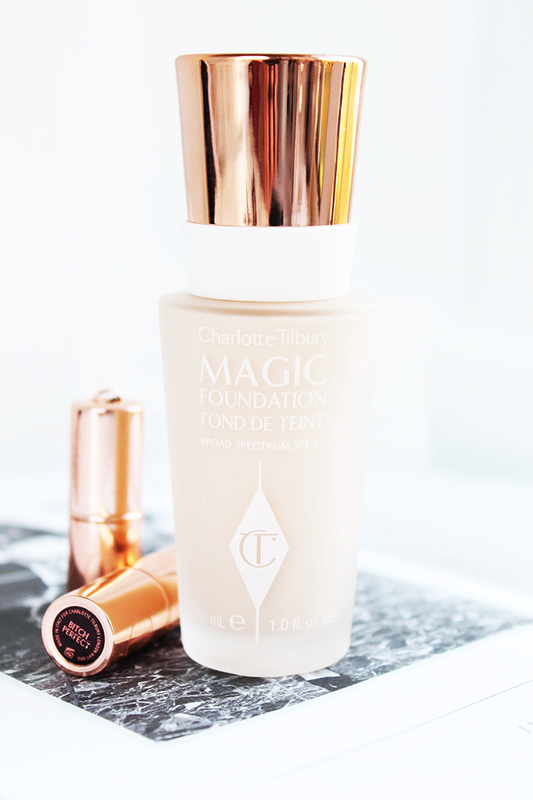 A couple of weeks ago you may have seen that I posted about my first EVER Charlotte Tilbury Haul, and in that haul I purchased the Charlotte Tilbury Magic Foundation. I'd been lusting after this foundation for an absolute age and I finally took the plunge and bought it. Being somebody who doesn't really tend to wear foundation, I'm always pretty sceptical about buying them, especially the more pricey, high end ones. So in this case, I definitely had to do my research and after lots of umming and ahhing, I decided to buy my first high end foundation - and I'm so glad I did. Described on Charlotte's website as 'a miracle in a bottle', i'm happy to announce that it really is just that. The formula of the foundation is full coverage, yet it feels incredibly lightweight on the skin, which surprised me. Usually when I think of a full coverage product, my thoughts immediately think of something heavy, caky and uncomfortable; this however is none of those things. What impressed me the most about this foundation though, is how much it looks and feels like skin. After application there is the most beautiful youthful glow to the skin, especially on my cheekbones I find, this was after applying the product with a beauty blender. Just a tip - you can use a beauty blender to achieve a lighter coverage, and get a more natural finish, and a buffing brush for a heavier coverage. Marketed as a product that would cover redness, acne, scarring and discolouration, as well as covering any wrinkles for the older customer, it makes a lot of promises; and I must say that in my opinion, it checks all the boxes and really packs a punch. I have normal-dry skin and I find that this sits comfortably on it, and it covers and neutralises a lot of the redness on my cheek area, as you will be able to see in the comparison photos below. I would recommend this foundation to people of all skin types, although it's a semi-matte finish, it still feels comfortable on my skin and in the winter I do tend to be pretty dry, and this also means it won't need powdering - so that's a huge plus! Although the price is on the higher side at £30, you really do get the most of your money with the quality of this product, and I imagine it will last a long time as I only needed one pump to cover my whole face. So, that's all I have to say in terms of this foundation. I hope this post was useful to anyone who was considering buying this, and if you have any more questions - leave them below!